So, without a line of code, you want to make something new, visually. You’ve got Max, you’ve got Pd, you’ve got vvvv. But for quickly cooking up generative visuals, dynamic interaction, live animation, and more from a clean slate, the other option had been Apple’s Quartz Composer, a tool that has lost a lot of steam (and acquired quite a few bugs) lately. Somehow, many people want some fresh blood on this scene. And that’s where Vuo comes in. From the creators of the Kineme plug-ins, it’s a chance to start anew. We’ve been eyeing Vuo with interest for a while. The nodal environment promises faster creation and new magical visual powers, a chance to see a from-the-ground-up modern tool amidst a scene mostly dominated by architectures created years and years ago. 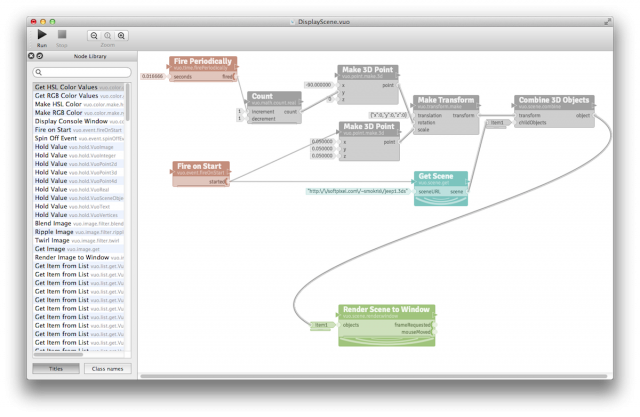 It could be the visual programming option that feels most modern. And now, Vuo has finally reached a proper beta. Early reactions are overwhelmingly positive – this is something people really do anticipate. That’s doubly impressive partly because the Vuo beta doesn’t do a lot of things you’d expect. A big deal-killer for many: there’s no video in/out. No audio, no OSC, no Syphon, no math expressions. Did I mention no video? These things are coming; you can check it out on the roadmap. But that has meant, in the meanwhile, what Vuo can do is already enough to whet some appetites – and early adopters are even pulling out their wallets to fund the effort. It’s something this community really hasn’t seen like this before. Fluid timing: compositions can run at framerate, or respond only to mouse clicks, MIDI notes, etc. 3D object loading via Open Asset import library. 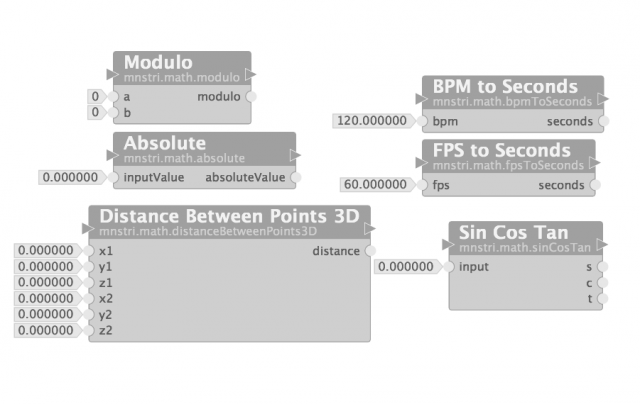 Basic data flow, logic and math, event control. Make multiple output windows with one composition. Built-in debugging: drag and drop nodes, monitor data flowing through them, and see what isn’t running. A subscription with video tutorials, community Q&A, and more. Subscribers also see the source code first; others get it on a lag. OS X now; iOS with 1.0, later Windows and Linux. So, those are the technical features. But perhaps what’s more telling is the reaction from the visual community. But it is true that it may take a dedicated community focused on the needs of visualists to pull off the Next Big Thing. And that endeavor is very likely to require money and investment – not even the most hardened free software advocate would argue otherwise. What’s striking is the outpouring of support from the community, as well as the clever ways the developers continue to encourage that feedback loop, from t-shirts to referral programs to unique subscriber benefits. Building on the reputation of Kineme and all it has done to aid artists’ work, the response is overwhelming. More on what Vuo can do, which will look very familiar to Quartz Composer users. Vuo Tutorial — Displaying 3D Objects from Vuo on Vimeo. Vuo Tutorial — Displaying Images from Vuo on Vimeo. Project Ruori @ electro-music 2013 from Steve Mokris on Vimeo.